Within the access console, active access sessions are divided into team queues. When you tap the Sessions icon located at the bottom of the screen, a listing of all configured queues appears. 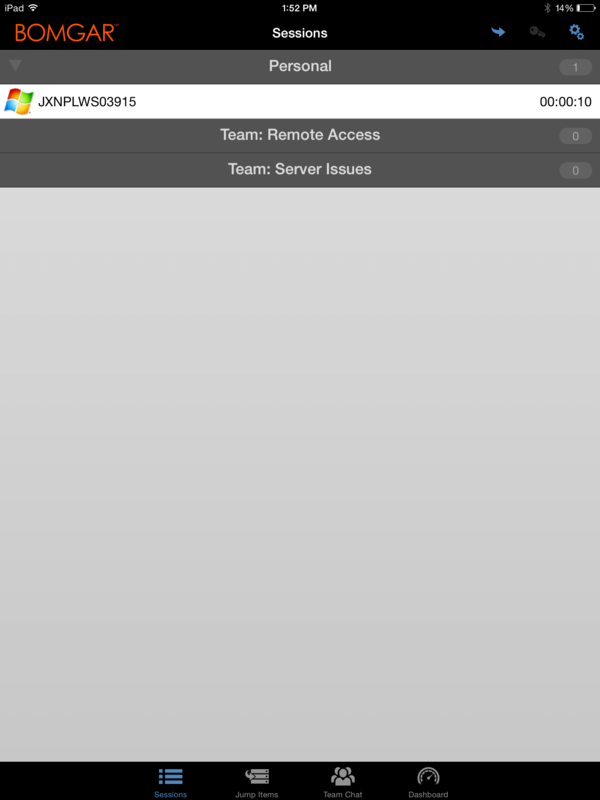 These queues are based upon the teams that you have set up in the /login administrative interface. Once a team is defined, a queue becomes available in the Sessions section of the access console. This queue is always displayed as long as at least one team member is logged into the access console. The Personal queue contains sessions that you currently have in progress or sessions that have been shared with you specifically by another member. The remaining queues are for specific teams of which you are a member. Tap the queue name to view any sessions that are in progress. Tap a session entry to view details about the system or session. To navigate to a session, tap on the Return option. If a session has been shared with you, simply tap the queue where the session resides. Then tap the session. Select Accept. Accepting a session will cause it to appear on your screen.